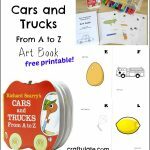 Kids will love completing this Animal ABC Art Book – with a different animal for every letter of the alphabet! This is our fourth ABC Art Book! We’ve also done ABC Trains, ABC Halloween, and ABC Christmas! I love the challenge of coming up with the alliterative descriptions, although as usual some letters are harder than others. So forgive me if not all 26 are strictly animals, because some birds and insects have sneaked in along the way! When we start each art book, I let my son choose which pages he wants to complete first. With this book, he chose “M is for Metallic Mouse” because he loves our metallic markers! Even when the words don’t lend themselves to any specific art technique (eg enormous elephant or loud lion) I try and mix things up as much as possible so it’s not “just” another coloring page. Try chalks, stickers, crayons, sequins, buttons – whatever engages your child. F – Fingerprint Fish – make fingerprints with ink or paint all over the fish to look like scales – see our in-depth post about this page here! H – Handprint Horse – paint your child’s hand with washable paint and press it onto the paper – the thumb becomes the head and the fingers are the legs. Add extra detail with a marker pen. Z – Zig Zag Zebra – draw zig-zags on the zebra instead of stripes! 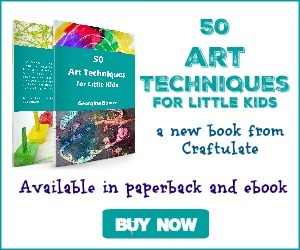 Get your own Animal ABC Art Book from the Craftulate Store!